When a group of zombie hunters encounters a walker that's just a little too fresh, the fetchling ranger Sebesten discovers far more danger in the Outlands than he expected. Can he evade the dead that walk? Will he discover what terrible force is behind this menace—and can he make it back to Blackbat in time to warn the stronghold of the approaching horde? Find out more in this exciting new Shadowsfall tale! Storm of Shadows is the third in the Shadowsfall Legends line of short tales taking place on the Plane of Shadows. Now available in PDF, mobi (Kindle) and ePub. Now available from Jon Brazer Enterprises. Download this exciting tale of heroics against the zombie horde. 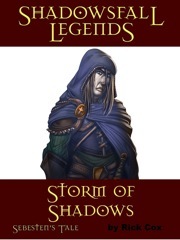 OOoooohhh... Shadowsfall fiction from TPK author Rick Cox! Awesome. Rick did an excellent job with this story. I'm really glad he wrote it for us, and I was glad to work with one of the skilled TPK team on it.